If anyone were to take a nice walk down a particular pleasant meadow, they might be shocked to find that the wind there seems to blow in some rather unpredictable patterns. And, if they look really carefully, they might also notice that there is periodically an odd blue-colored distortion that seems to be rushing along the tops of the hills. Now, such a person might not think anything specific about that. Strange clouds, they might wonder, shrugging their shoulders and continuing their seemingly peaceful hike along the Green Hill Zone. But, oh, would they be wrong! If they could manage to squint their eyes at just the right moment, they’d be truly shocked to see that the blue blur that they had previously shrugged off was, in fact, the star of the Green Hill Zone, fervently trying to stop the crazed assault of countless tiny animals who had been stuffed inside the mechanical marvels of a madman in his dastardly plans to acquire the mystical Chaos Emeralds. They might have been saved by the one and only Sonic, the Hedgehog, and never have even spotted their blue savior! Your kiddo knows all about Sonic, of course, and Dr. Eggman’s wicked plans might have suddenly come a little closer to home than we might have ever before expected. We’re going to need some help, and the sugar-fueled energy of your little tyke might be exactly what we need. 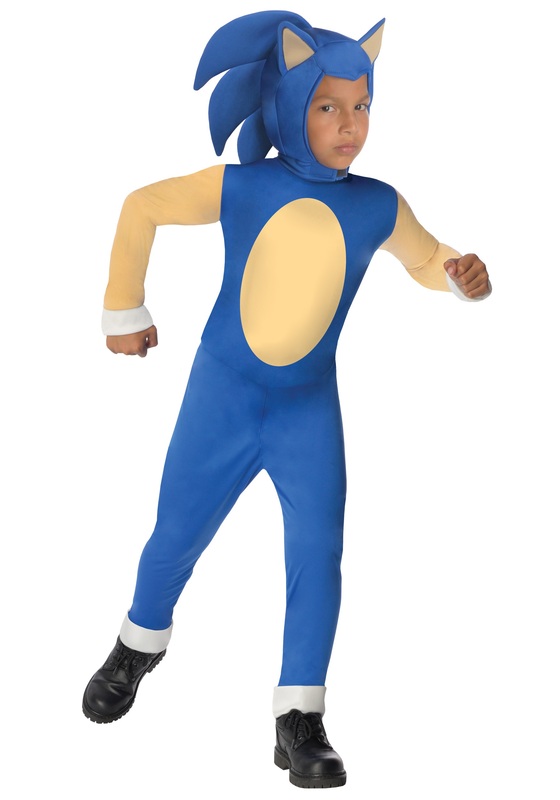 Help save the world with this Child Sonic costume. This bright blue jumpsuit has a tan stomach and arm as well as the iconic blue spikes along the back of the Velcro-attached headpiece. Simple white ankle and wrist cuffs give a nice contrast where Sonic’s own gloves would be. The actual super speed, countless rings, and Chaos Emeralds will have to be otherwise acquired, but even the presence of Sonic will help to relieve everyone of their stress this year. Rush to suit up; there’s no time to lose!